– prewritten texts like: how to find the right wedding photographer & why the connection between wedding photographer and wedding couple is important. 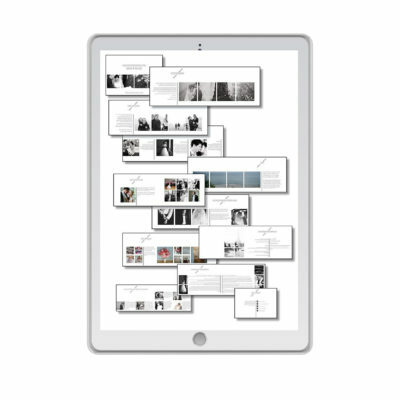 – A lot of space to showcase your portfolio spread over the whole magazine. – Double page feature for behind the scenes images. – Some facts and information about the photographer through a nicely designed questionnaire. – A welcome page to introduce the photographer and the magazine in disguise as the Editor’s letter. – A selection of wedding vendors that the photographer recommends to his bridal couples. – The images that every bride and groom want of their wedding day spread over several pages to showcase the advantage of a full day wedding photography coverage. – Column: How to find the right wedding photographer? – Column: Why we think the connection between wedding photographer and wedding couple is important.